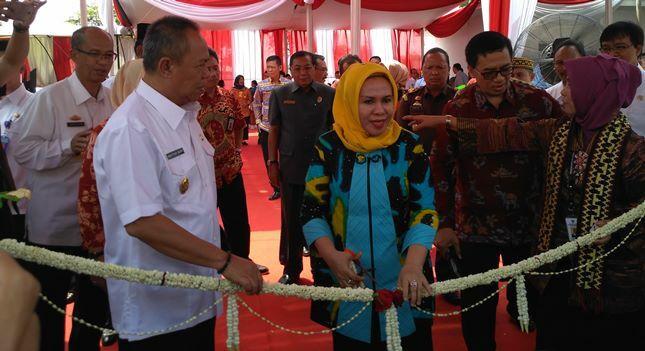 INDUSTRY.co.id - Lampung- The Ministry of Cooperatives and Small and Medium Enterprises (SMEs) inaugurated the Integrated Service Center for Small and Medium Enterprises (KUMKM) of Lampung Province, together with the launch of Kampung UKM Digital Kota Bandar Lampung. "PLUT Lampung is included in the regional technical unit (UPTD), and this digital village becomes very important for KUMKM business actor in Bandar Lampung city," said Deputy of Restructuring of Kemenkop and UKM Business Division, Yuana Setyowati in the inauguration of PLUT and Kampung Digital KUMKM Lampung Province, Wednesday (9/8/2017). she said, PLUT KUMKM Lampung Province is one of 51 PLUT KUMKM in Indonesia located in 24 provinces and 27 districts and cities. PLUT KUMKM serves to provide KUMKM facilitation services in the areas of institutional, access to finance, human resources, production, marketing or business partnerships and IT access. PLUT KUMKM as a business clinic under the coordination of provincial and district governments and cities, is expected to play a role in KUMKM assistance to improve KUMKM productivity and competitiveness in local and global markets. The KUMKM PLUT building is implemented by Kemenkop and UKM through the assistance task which sourced from APBN in 2016. "The investment of PLUT building development reaches Rp 3.9 billion," said Kuskm Plut building asset to local government. According to her, the above needs to get the attention of all parties, both governmental elements and SMEs and the general public. All parties are expected to support domestic market strengthening strategy and simultaneously prepare UMKM to be able to compete and expansion through export market. Cooperation can be done on synergy between Provincial Government and private sector, one of them is PT Telkom Indonesia which provides fast internet service facility U Meet Me, UMKM perpetrators market their products faster and video conference with 20 colleagues at a time. Meanwhile, Vice Governor of Lampung Province Bachtiar Basri instructed to maintain PLUT building and optimize for KUMKM in order to compete with other provinces. In Lampung there are currently 5,300 cooperatives and inactive there are 3,000. Therefore, it will reconstruct any superior cooperative that becomes an iconic example of Lampung city so that it can export and increase the contribution of PAD. Not only that, Lampung Province has also provided assistance in strengthening KUMKM capital, Assistance Messages Vegetable Messages Send as well as certificate of competency test manager.